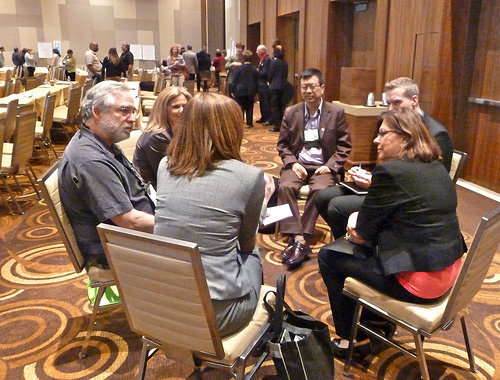 Do you want to run truly successful Professional Development experiences? Nothing has promised so much yet wasted so many hours than PD workshops that do not inspire real change in the classroom. We have all been there!! Those PD days that provided only some small promise of innovation. Some momentary glimmer of hope – for a few at least but not for all. But how can a PD cater for the needs of every attendee? What if we flipped the conventional PD forum? What if the attendees picked the topics to be discussed? Could this work? 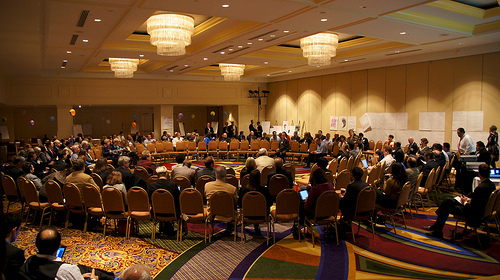 This is the basis for the Open Space Technology (OST) or the unconference conference – a professional development experience that sees the participants as central to the creation of the agenda for the day. This new technology has great promise for staff meetings and in school workshops. It can be used as a powerful tool for change, to enact a shared vision, or devise an authentic strategy to foster community relationships. 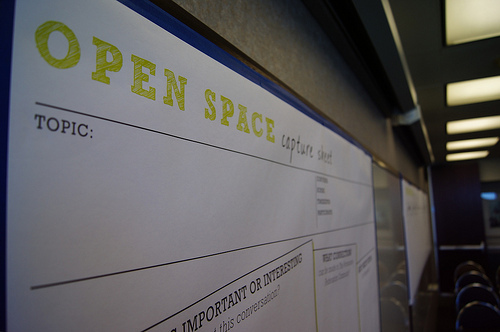 Why should you use Open Space Technology? OST is an exciting new way of facilitating workshops and meetings that ensures every voice is valued. OST is an empowering process that encourages the exploration of a shared and preferred future for all those involved. OST promotes ownership and accountability to participants as it breaks down hierarchical structures of knowledge and leadership. OST builds a community because it fosters authentic relationships where people can learn from each other and work together to build a shared vision for the future. OST promotes ideals of cooperation, accountability and generosity and works effectively to solve complex and wicked issues as it generates new ways forward, new ways of thinking, and new ideas to nurture. OST cultivates equity and inclusion because all experiences, all knowledge, and all expertise are shared, valued and explored with genuine interest. 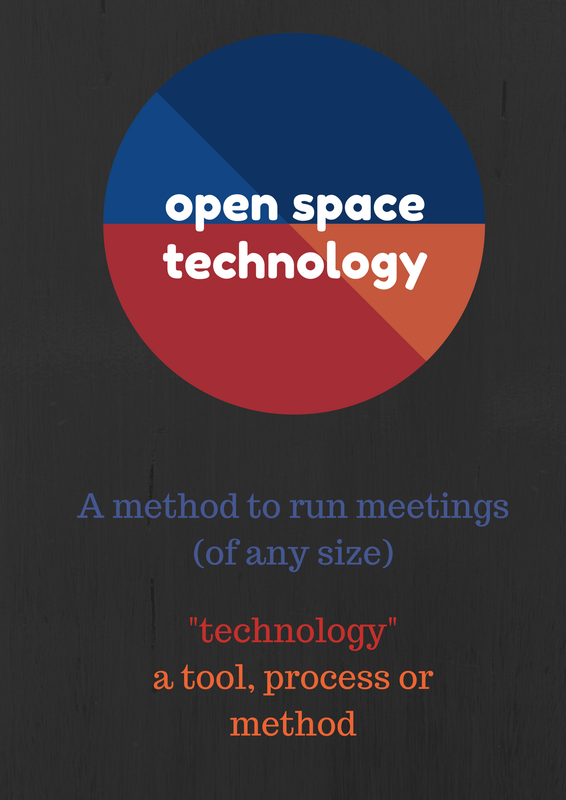 So what is Open Space Technology? 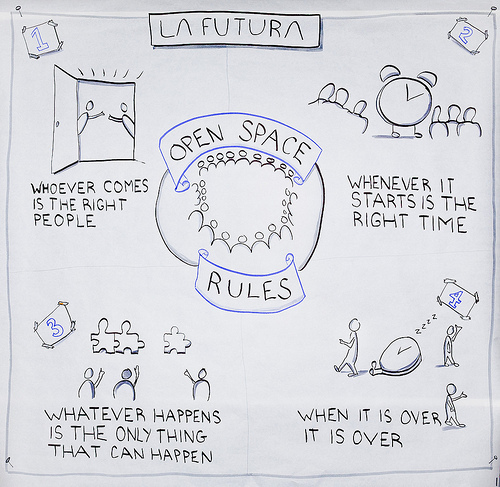 Open Space Technology employs a democratic process for establishing a self-organizing agenda during a professional development session. Organizers of the session decide on a theme but leave the setting of the agenda to those in attendance via a collaborative process. In this way everyone, regardless of their background, can learn from each other. It works on the basis of breaking down the invisible barriers between the presenter and participants. No one person can claim to have all the answers. Instead OST offers a new, open and transparent way for surfacing cooperative and creative knowledge when faced with complex and wicked problems. As such, when using OST at a PD day, a staff meeting, or a conference, the session becomes participant driven and ultimately empowers everyone to be actively involved. To ensure the session is effective, it’s important to have a well-defined objective when using OST. There are some clear guidelines but mostly OST operates on the ideals of choice and flexibility. 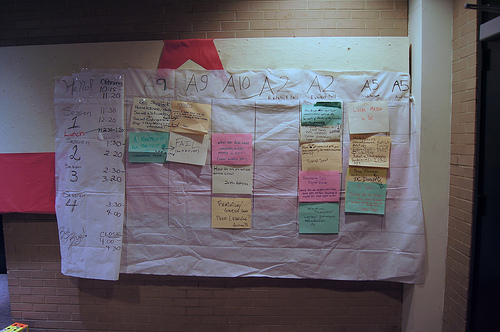 Facilitators begin the session with a blank agenda wall but with the session times clearly visible. Participants choose what they would like to discuss and add this on a post-it note to the agenda wall. Post it notes are placed in certain session times. This is a very organic process. To achieve success, a climate of relaxed trust and safety is paramount. 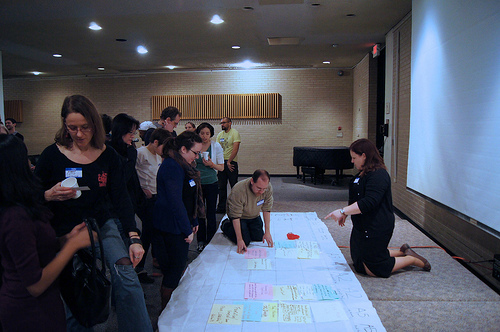 Once the post it notes are on the wall, participants choose to take charge of particular sessions relating to the post it notes that are on the wall. Participants will run the session, take notes and follow up on actions. There might be 20 people attending a session, or only one, or none at all. It doesn’t matter. This just indicates the energy behind the topic, and allows participants to sit and reflect on the topic, or join another session. If you aren’t in the place where you are learning and contributing, go somewhere where you can. 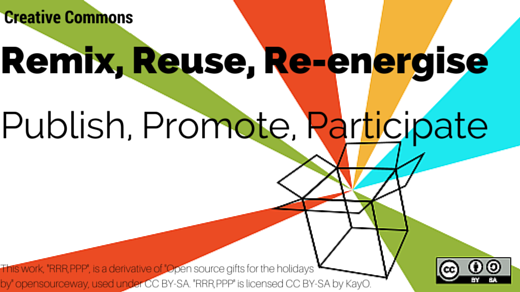 What this means is that participants can move from session to session as they please. Hence, there can be “bumblebees” or “butterflies”. A Bumblebee buzzes from group to group cross-pollinating ideas and stinging with some tough questions. Whereas a butterfly takes a while to settle into sessions to float and flitter amongst and through the conversation before finally settling into one of them – but this is okay! Don’t forget the ideals of choice and flexibility. OST will work if all communication is transparent and engaging before, during and after the event. Before the session/event engage participants by creating a poster that includes ideas, topics and, most certainly, the theme. Alternatively, communicate using web 2.0 tools such as a wiki, Weebly or by using social media sites such as Twitter. If you are using Twitter then it is important to create a hash tag and display this on the posters that are created. During the session/event the provision of ongoing communication through a white board or blank wall helps, and this is something that the venue must be able to provide when choosing a place to host an OST event. Also, Twitter can be helpful in creating an engaging continuous conversation about the ideas being discussed. Here, creating a back channel or a tweet wall would encourage some wider discussion, statements and questions amongst the participants. After the event the use of storify to capture these innovative ideas would ensure that the momentum is not lost amongst your participants. So give it a go in your work place and see what possibilities can come from empowering your participants in your next staff meeting, workshop or conference. Unlearn what you know about PD and unconference your next event! Brisbane Catholic Education staff can contact ResourceLink to find out more about this exciting new way to organise successful PD. About 3 years ago, I wrote two posts describing Augmented Reality and exploring the potential of Augmented Reality in education and the workplace: Augmented Reality – Even Better than the Real Thing? 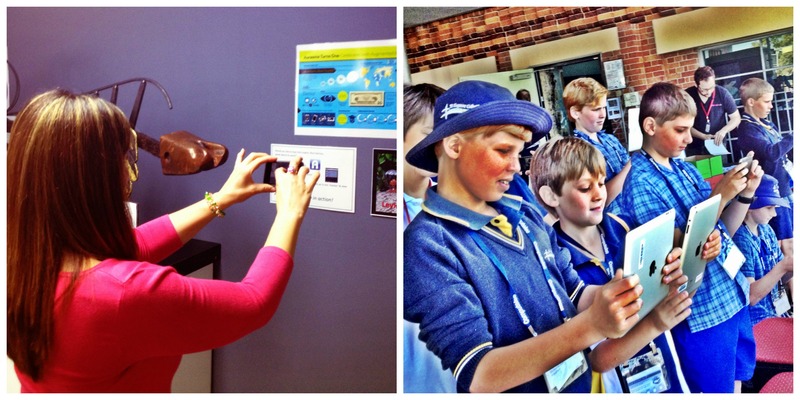 and Bringing Augmented Reality to Life – in the classroom and the workplace. As you can expect, a lot changes in three years – resources such as String, which I explored previously have morphed to embrace new concepts, while tools like Aurasma have continued to develop the quality of their experience, providing more reliability and better results than ever before. What’s more, tools like Google Cardboard are moving beyond augmented reality, and providing a completely virtual reality experience – more on this in a future post! But back to Augmented Reality (AR) – where technology allows you to create a ‘layer’ of information over a person’s experience of the world. When you think about it, educators are the original ‘augmented reality’, providing an overlay to student’s perspectives! Tools such as Aurasma enable learning to be engaging in a completely new way, and this post aims at providing some ideas as to how AR can used by students to raise their expression of learning to a new level. As I introduced in earlier blog posts, Augmented Reality apps come in two main forms: the first is where a printed trigger image initiates an interaction through the camera of the mobile device, and the second where the app uses the mobile device’s GPS capabilities to ‘layer’ digital data over the location where the user is. It is the first type where students can really get involved in the creation of AR, as they can either create both the trigger image and the overlay, or just overlay their own creation onto an image (or item, e.g. a book cover), through using an app such as Aurasma. There are a few other apps which allow for this AR creation, one notable one being DAQRI (you can see its potential here). However, Aurasma appears to be the most stable and currently the best on the market. Access to the Educator’s 4D DAQRI Studio appears to be currently unavailable. In education, creating an overlay which enriches resources is the most obvious way to use this technology. Imagine being able to embed a book trailer video directly onto the cover of a book, so that students could simply open their phone or other mobile device to the AR app, scan the cover of the book and immediately view the trailer; AR makes this totally possible. Even better if the book trailer is student created – a way to bring student voice directly into the reading experience! Another option would be to augment a student’s artwork with a video of themselves explaining the work, or a montage of the pieces that inspired their creation – again, not only possible, but easily and quickly done. A third option is to record a student performance, and then embed this directly onto the criteria sheet, so moderating teachers simply view the sheet through their mobile device to review the student’s singing, dancing, acting etc – what a powerful way to bring assessment to life. With creativity and imagination, the options are endless. What about using a video to demonstrate the correct pronunciation of foreign language words for a LOTE class, and overlaying these on the flashcards, or researching the plants in the school grounds and overlaying videos with this information onto signs near those trees or plants for others to view. Bring the map of the school’s local area alive with videos of elderly residents sharing their stories of how the area has changed, or link the school choir singing the school song to the logo on your newsletter. Even better, link newsletter photos with video, so parents can experience the moment as it happened. Younger students could create slideshows of images all beginning with a particular letter or blend and then embed these on alphabet cards, while senior students could list the properties of elements and develop an interactive periodic table..it doesn’t matter what age or stage, AR can allow students to demonstrate their own learning, and then easily share it with others, creating useful resources that other learners can benefit from also. These are just some examples of how you could use an App such as Aurasma to bring AR into your classroom. Aurasma is one of the easiest ways to create your own AR overlays. You can do it within the app on your mobile device, or, if you want greater flexibility, download the Aurasma Studio to create on your computer. Once you have developed confidence with creating the overlay and combining it with the trigger image to create an AR experience, you can then distribute these either via email to specific users, or more broadly by creating your own ‘channel’ to which users can subscribe. Either choice is easy to set up either within the app itself, or in the online studio environment. This field is changing all the time, so the best thing to do is just jump in and try it! Now that many students have access to mobile technology (either at home or at school or both), the implementation of AR is likely to become more common (at least more common than it was three years ago when I first wrote about it!). If you would like to learn more, check out this Pinterest board, which has a growing range of links to different ideas, apps and information about AR – and if you bring AR into your classroom, drop us a line in the comments – we’d love to hear from you! In March, I was honoured to be invited to present at the EARCOS 2015 Teachers’ Conference, at Sutera Harbour, Kota Kinabalu, Borneo, Malaysia. This conference hosted over 1100 delegates from international schools from the East Asia Region – including China, Malaysia, Phillippines, Myanmar, Singapore, South Korea, Japan, India and more. It was hosted in collaboration with SENIA (Special Educators Network in Asia), and with the theme of “Language for Life”, there were over 100 workshop sessions to choose from, focusing on literacy, language and learning. The entire conference was an immense learning experience. The decision by the conference to forgo what are (largely) useless conference bags, instead donating this money to Operation Smile, a private not for profit organisation providing reconstructive surgery to children and young adults born in developing countries with facial deformities told me that this would be a conference different to any other I had attended. I was right. I learnt from keynote speakers John Wood and James Stronge, as well as from a range of presenters from the workshops I attended, from the delegates I met and spoke with, and from the experience of presenting to a truly international audience. In this blog post I will try to capture the flavour of the conference, and some of the key learnings I took away from it. I will also include access to the Storify I have compiled, which captures a range of resources from social media (mostly Twitter), which were shared by delegates and presenters throughout the conference. Learning 1: Want to change the world? Educate children! The keynote speaker on the first day was the inspiring John Wood, who founded the Room to Read programme, which focuses on working in collaboration with communities and local governments across Asia and Africa to develop literacy skills and a habit of reading among primary school children, and support girls to complete secondary school with the life skills they’ll need to succeed in school and beyond. So far, Room to Read has constructed 1930 schools, established 17 534 libraries and published 1158 books in local languages, as they work with people to develop a sense of ownership and engagement with education and literacy. Why is this inspiring? Beyond the obvious, it is inspiring because this project doesn’t focus on giving hand outs – it focuses on working with the people on the ground, so that when the ‘outsiders’ walk away, the project doesn’t just crumble; it continues on, driven by the locals who have been involved from the beginning. It also recognises that investing in children can lead to significant change – educated children become educated adults, who can work to make the changes they want for their communities. It is ironic that in Australia, and in many other Western, 1st world countries, libraries are increasingly being underfunded and understaffed, when so much of Room to Read’s focus is on building libraries up. Why is this so? Are we satisfied with our levels of literacy, and believe that there is no further need for free and open access to information, literature and inquiry? Ironically, in the age of exploding information and multiple literacies, we are letting go of those people and places who are best placed to support us! A challenge indeed for educators and administrators! The work that Pana Asavavatana and Maria Peters are doing in Early Childhood at the Taipei American School in Taiwan is amazing. Using a wide variety of resources, these inspiring teachers are incorporating robotics and coding into their early childhood curriculum, in creative and engaging ways. With an emphasis on skill development, Pana and Maria emphasised that kids need to ‘unplug’ to learn computational thinking skills long before they get their hands on any type of technology – and with a range of games and activities, they have done just that. Generously sharing their planning as well as the cutest posters and resource ideas, this session brought home the fact that in today’s world, the literate child can do far more than just read and write alphabetic text. Ok, so this one wasn’t really a learning so much as a confirmation of my beliefs from someone whom I have followed online for a long time. Jeff Utecht, of The Thinking Stick blog, has been someone that I have learnt from since my earliest days on the web. His work in international schools and beyond has focused on quality pedagogy enhanced by technology; rather than the other way around, and his session of Search brought home to me just how vital librarians, with enhanced skills in information literacy, are to schools and education. Librarians are some of the best qualified to teach what Jeff states is the most vital skill of our age – that of search – and in Jeff’s session, he revealed a plethora of tools and strategies that support the explicit teaching of these skills to students. In preparing my four 90 minute presentations on Content Curation, Infosavvy Students, Makerspaces and Creative Commons, I realised that the best presentations are the ones that convey ideas simply, and which provide many practical take-aways for the participants. In researching, preparing and creating these workshops, I thought I had learnt almost everything I needed to know on these topics. However, through presenting them, responding to questions, discussing with participants and reflecting on how each session went, I learnt so much more. The experience was rewarding as it was a challenge to prepare workshops for an essentially unknown audience, from a wide range of schools in different countries, with different access to technologies and the internet. I learnt that while international schools face unique challenges to those in my Australian experience, educators the world over are united by a desire to connect, to provide access to the highest quality resources, and to instil in students not just content, but the ability to learn, solve problems and navigate a complex, information saturated world. I also learnt that international schools are at the cutting edge with their approach to contemporary learning; and that the work we do here at BCE and in ResourceLink is equally current and of the highest quality! Below is a small selection of some of the key takeaways from the conference. For a more detailed summary, please read the Storify I created, a compilation of some of the best sharings from social media throughout the conference. Today my colleague and I were fortunate to participate in a workshop run by the passionate and inspiring Liz McGettigan, who is the Director of Digital Experiences at SOLUS. The workshop was entitled Changing Spaces, Changing Minds, and focused on how to combine the physical with the virtual in public spaces. Although the workshop was aimed at Librarians, and investigated Liz’ and the participants’ experiences in libraries, many of the ideas and concepts could easily be adapted to apply to any learning space. 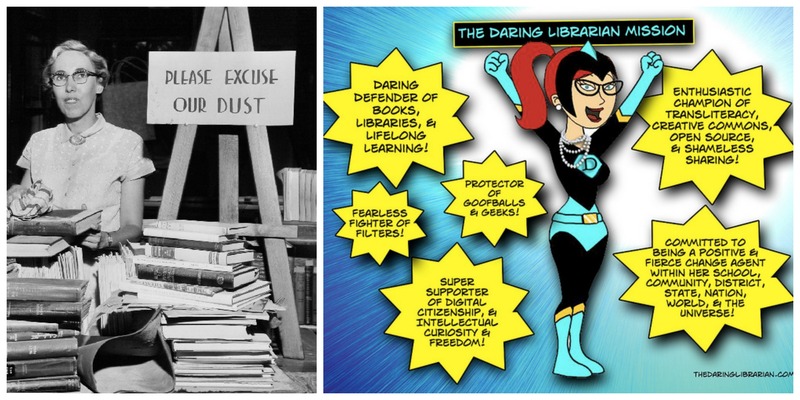 Like many institutions, libraries are currently in a state of flux. Whereas once libraries were a fount of knowledge, and librarians the gatekeepers of information, today, everyone has the world’s information in their pocket. So how do libraries (and many would argue schools) remain creative, relevant and sustainable community spaces where rich, real and relevant learning occurs? Just like in Will Richardson’s text Why School? (a extended essay which for $3.10 is a must read for anyone involved in education), Liz challenged us to step away from negative mindsets limited by funding shortages and staff cuts, and instead to embrace a new way of thinking about libraries, which focuses on leadership and vision. “At a time when the provision of knowledge and culture is increasingly digital and screen-based, the value and importance of high-quality physical spaces and experiences is growing, not diminishing” Roly Keating, CEO British Library. This quote by Roly Keating set the stage for an important discussion – how to effectively combine the physical and the virtual – to find the right balance so that library is seen not as a dusty remnant of the past, but as a living incubator of ideas, learning and innovation. The clues for how to achieve this are in the strategies employed by the commercial sector – entrepreneurial vision, effective marketing and meeting user needs – indeed, Liz encouraged us to ‘shake of our modesty’ and promote the wonderful work libraries do, and to make sure everyone knows that the library they remember from their childhood is now a completely different space! The libraries of yesterday are nothing like the centres of creation and inspiration they are today! A staff member viewing Rick’s video explanation using an iPod touch. We deliver a hybrid collection of resources, including physical items, digital and online resources through our online catalogue. Indeed, my colleagues and I joke that we would like our library management system to be one day ‘greater than Google!’. We use a range of different tools for information service delivery, including social curation tools such as Pinterest, Diigo and Bag the Web and social catalogues like Library Thing (click these links to see some of our collections). 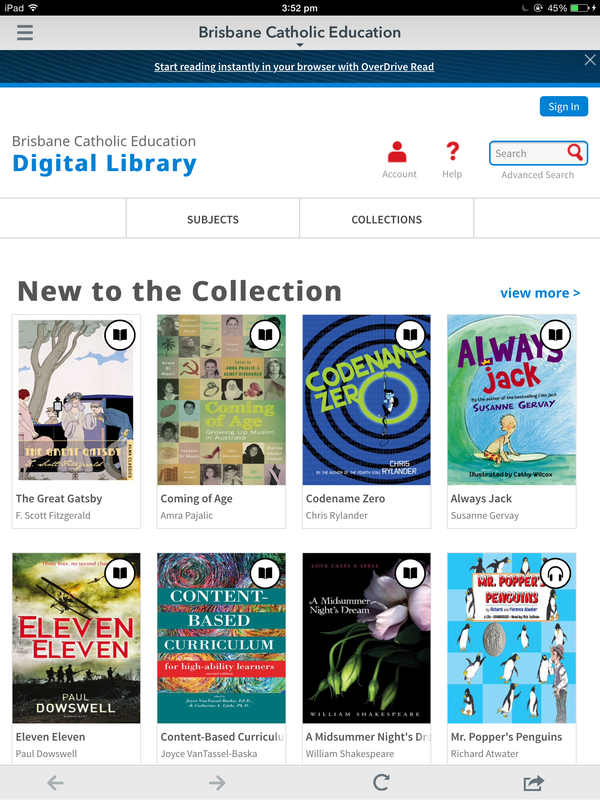 The BCE Digital Library is delivered via our online library catalogue and enables students and staff at all 137 BCE schools to access ebooks and audiobooks. Additionally, we provide access to e-books and audiobooks using the Overdrive platform, integrated within our library management system. Also included in the catalogue are bibliographic records linking to resources that include online video clips, websites and app reviews. Users may also search and access a selection of alternative providers from within the catalogue. This carefully evaluated and up to date list of alternative providers include Getty Images, Khan Academy, the Metropolitan Museum of Art, and the Australian National Library. In doing so, it is hoped that if no physical item is available to meet the user’s needs, there is a far greater chance that the information the user is seeking will be available via one of these alternative formats or avenues. 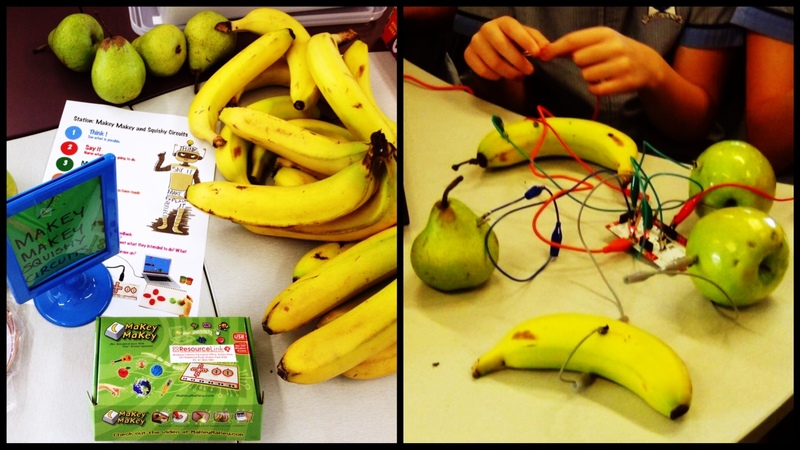 We have also dabbled in Makerspaces, creating kits that schools can borrow so that they can play and learn. The development of these kits was inspired by the work of Gary Stager and Sylvia Martinez, and was informed by the best use of our space, and the needs of our users, which are mainly schools. You can read about these kits, and see how we put them together in these blog posts, Resourcing the Maker Movement and Running a Maker Faire. What’s next for ResourceLink? Inspired by Liz McGettigan’s workshop, we hope to venture more fully into the social media space, engaging with our users more regularly in the virtual world, and spending more time developing our knowledge around online learning. We aim to continue developing our content and to work towards truly being an incubator of ideas, inspiration and imagination.